Member of the Midwest Collegiate Cycling Conference. 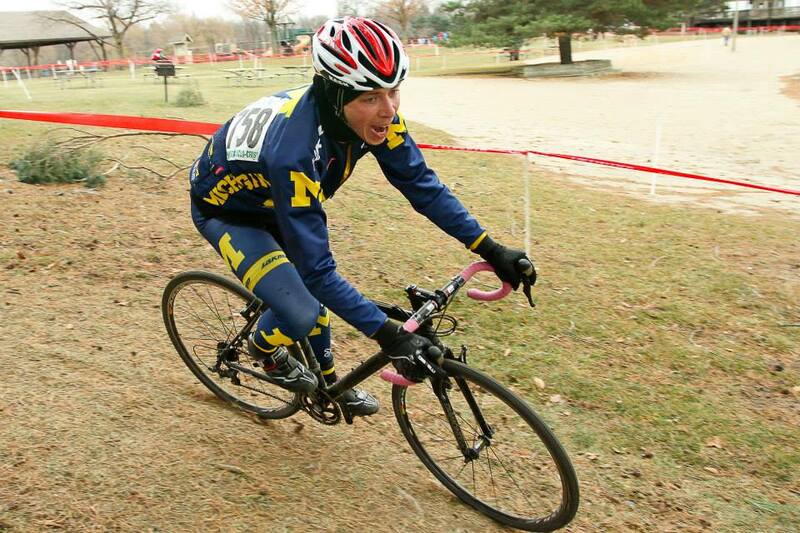 The University of Michigan cyclocross team was represented across nearly all categories at the final day of racing of the season at the State Championships in Addison Oaks, MI. When term started in September, the squad welcomed many new members, with some entirely new to racing. We also welcomed back our experienced racers, hungry to progress in their careers this fall. Both groups went on to achieve performances that make this season one of the greatest ever for U-M cyclocross. At Addison Oaks, outstanding performances on the most important day of racing in the calendar only confirmed the team’s hard work and preparation. Tailwind had chosen to stage the finale of the season on the flattest and fastest course of the year so far. Long stretches of Tarmac and no serious climbs or drops made this a lung-bursting, aggressive circuit. Three sandpits of up to 30 feet in length provided a test for the riders’ technical abilities. And the final section hid perhaps the most trepidatious corner of 2013 Michigan cyclocross so far: a heavily gravel-strewn, speedy 90 degree turn onto the finishing straight. The conditions remained positively polar in the mid-20s with isolated snow showers for good measure. 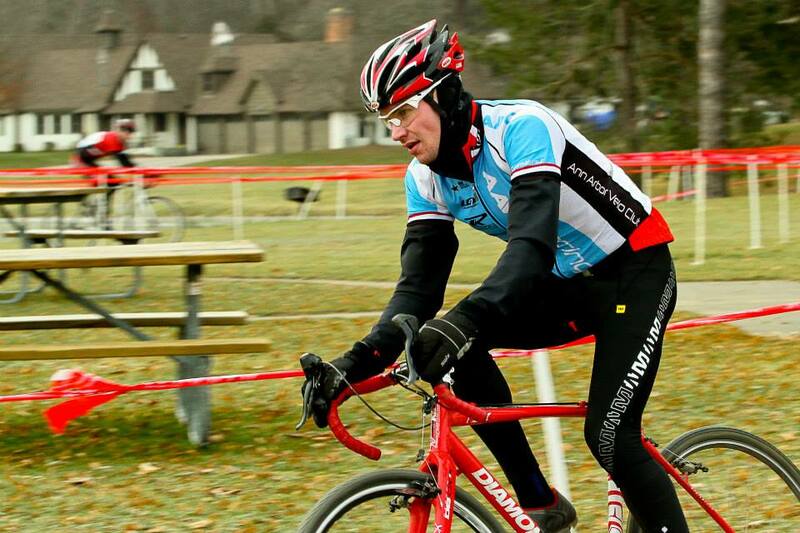 Cyclists often found the ground frozen solid and ice underneath some of the grassy sections. In these conditions, Tyler Carlton became U-M’s first State Champion of the day. In his Category 4 race, he finished first in his age group and sixth overall to claim the State Championship in his age group. Ellie Sterne then won second place in a thrilling Elite Women’s race that saw her having to recover from a stinging crash in one the last laps. The team wishes her all the best for her recovery! In his Category 3 race, Danny Soltan continued U-M’s success by winning our second State Championship by coming first in his age group and second overall. Danny only upgraded to his current category halfway through the season. Our coach, Kurt Schaldenbrand, continued his comeback from injury by finishing in eleventh place in his 45+ Category 3 race. It is rumored that he has been speeding up his recovery by practicing on a homemade cyclocross course in his back garden. Finally, Phil Ginsberg provided the team’s third State Championship jersey by winning the Category 5 race. The graduate student from England was overheard confirming that this was “bloody brilliant”. The entire team would like to thank all of our sponsors and supporters, without whom all the fun and success we have had this season would never have been possible. They include Jeremy Ziegler and Marc Mueller from PowerCycling, Will Jurkowski and his team at Transition Rack, U-M Recreational Sports, and many more. We are also especially grateful to Rebecca Wissman and everyone at Tailwind Racing, for whom no organisational challenge is too big, no corner of any course unloved, no early morning too cold and no cold afternoon too long to stay and pack up the course long after most of the racers have left. The U-M cycling team will continue its campaign when the collegiate road season begins in February.